How Important Is Your Fellowship Application Personal Statement? As part of your application to a musculoskeletal radiology fellowship, you will be asked to provide them with a medical fellowship cover letter or personal statement. This will seek to explain to the committee who you are and why you will make such a good fit within their fellowship program. If it is written well it can often be the deciding factor in your selection. However, being able to write to the expected standard is not easy at all and can often take up a significant amount of your time. 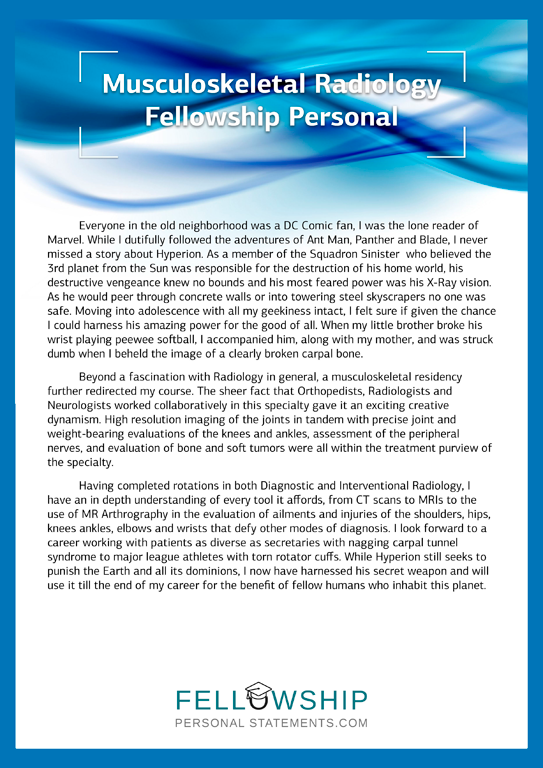 What Needs to Be in Your Musculoskeletal Radiology Fellowship Personal Statement? What professional goals do you have for the short and long-term? – What will you be doing after you graduated from the fellowship? What do you envision having achieved five or ten years later? What is your ultimate and final goal in life? List these goals and how you want to reach them, make it clear that you understand the difficulties involved. Where did theses aims come from? – How were they started and for how long have they been occupying you already? Did they originate from experience, a challenge or something different? Explain! Committees want to find the reason behind such a decision and what motivates you. What have you undertaken so far to meet your goals? – What have you done beside your regular education that enhances your skills towards your goals? Any community activity or volunteer work done? If permitted admission to the fellowship how will it affect your goals? – What contribution will the fellowship make towards your aims? Our Writers Can Write Your Musculoskeletal Radiology Fellowship Personal Statement? They will write clear and concise – Utilizing simple and easy language that is to the point. They will not heap an abundance of adverbs and adjectives onto the content. They will think up a theme – This will help provide structure and tying it all together. “Everyone in the old neighborhood was a DC Comic fan, I was the lone reader of Marvel. While I dutifully followed the adventures of Ant-Man, Panther, and Blade, I never missed a story about Hyperion. As a member of the Squadron Sinister who believed the 3rd planet from the Sun was responsible for the destruction of his home world, his destructive vengeance knew no bounds and his most feared power was his X-Ray vision. As he would peer through concrete walls or into towering steel skyscrapers no one was safe. Moving into adolescence with all my geekiness intact, I felt sure if given the chance I could harness his amazing power for the good of all. When my little brother broke his wrist playing peewee softball, I accompanied him, along with my mother, and was struck dumb when I beheld the image of a clearly broken carpal bone. Beyond a fascination with Radiology in general, a musculoskeletal residency further redirected my course. The sheer fact that Orthopedists, Radiologists, and Neurologists worked collaboratively in this specialty gave it an exciting creative dynamism. High-resolution imaging of the joints in tandem with precise joint and weight-bearing evaluations of the knees and ankles, assessment of the peripheral nerves, and evaluation of bone and soft tumors were all within the treatment purview of the specialty. When receiving the first draft, please revise and ask for any alteration you deem necessary. You will be entitled to an unlimited number of revisions until you feel comfortable with the content and presentation. You must be confident and well versed about the statement when it comes to an interview. If you need help with your personal statement for your musculoskeletal radiology fellowship application just contact our experts here today!